Properties in Puglia average 4.7 out of 5 stars. Property 16: Sea port "SCIROCCO room"
Property 17: Porto Di Mare Exclusive room "Libeccio room"
Thu Horses B & B located in the Gargano National Park, between sea, lakes and forests. Property 24: Thu Horses B & B located in the Gargano National Park, between sea, lakes and forests. B & B Maria Chiara "Primula"
Property 28: B & B Maria Chiara "Primula"
Ground Floor Double Room in "Donnosanto Residence"
Property 34: Ground Floor Double Room in "Donnosanto Residence"
Double Room with Private Bathroom, with Hydromassage Shower. Central Zone. 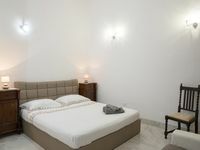 Property 39: Double Room with Private Bathroom, with Hydromassage Shower. Central Zone. B&B IL BORGO - EXPERIENCE SALENTO! Property 41: B&B IL BORGO - EXPERIENCE SALENTO! Property 46: B & B Maria Chiara "Giglio"
The spacious Trulli was just perfect We were able to cook and lounge by the pool. Enjoy the gardens and sit outside for coffee or wine. Loved it! !